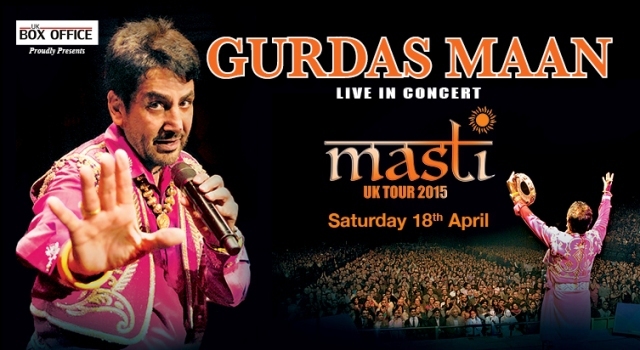 Pioneering Punjabi singer-songwriter Gurdas Maan returns to Birmingham as part of his 2015 Masti Tour. This time around, Gurdas Maan has picked the title Masti, which means "a level of heightened excitement; often divine". The concert at Genting Arena, Birmingham - formerly Birmingham NEC - is set to include both classic and modern favourites from his repertoire that has spanned three decades. It takes place on April 18 and will merge eastern and western flavours. Recognised by most as the stand-out artist of his industry, the singer has millions of Asian music fans worldwide along with over 34 albums and 305 songs to his name, many of which have been used in Bollywood films. Gurdas Maan is also famous for his acting roles in films Waris Shah-Ishq Da Waaris and Shaheed-E-Mohabbat. In 2013, he thrilled Birmingham fans when he visited the city on his Ishq Da Giddha tour at the LG Arena, and he is hoping to do the same with his 2015 stop off. Tickets cost from £40.08 - £79.45 from the Ticket Factory website or by calling 0844 338 8000.